Common Name : Morels, Black Morels, Early Morels, Fire Morel, Guchhi. Habitat : It is present in moist places of high hilly areas, forests and meadows. it is solitary in nature and occasionally present in clusters. in india is present in kashmir and hilly areas himachal pradesh. 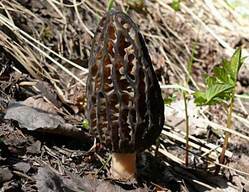 Uses : Morel is edible, having delicious flavor and taken as vegetable. It is antioxidant, antimicrobial, anti-inflammatory and nutritive in nature.